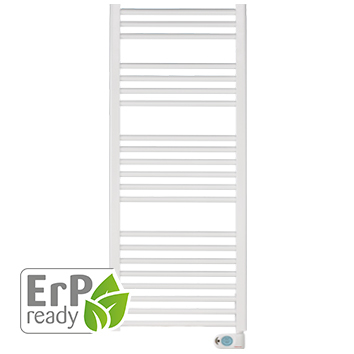 GABARRÓN range of towel warmers and towel radiators allows to treat yourself to the warmth and luxury of toasty warm towels and also to the advantages of a heated bathroom. It reduces moisture, mildew and must. It’s also great for taking the chill from coats and outerwear, warming up baby blankets and drying delicates. Three sizes and power are available in a choice of white or chrome finish, making them suitable for almost any size or style of bathroom. TBBi white line comes with a digital control for turning the rail on, controlling the temperature or putting it on timed. It can be switched on for one to two hours constant heat. Fully compatible with PILOT WIRING multi-zone central controller. 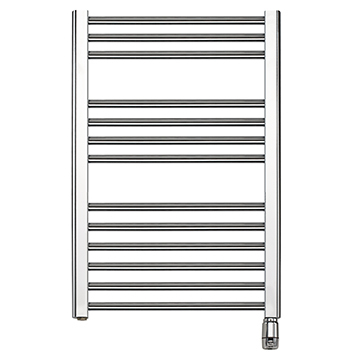 TBC chromed version comes with an analog control for turning the rail on and controlling the temperature..
TBBi and TBC towel rails and towel warmers come fully equipped with an electronic thermostat that allows you to maintain a stable heat, guaranteeing warmth and low running costs. Both versions have an IP44 protection and security thermal cut out. Low power versions are also available in white and chrome finish. They are a perfect addition to your central heating system.